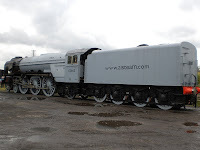 THE BRITISH RAILWAY STORIES LTD: "Railroad Tornado: We Fade to Grey"
"Railroad Tornado: We Fade to Grey"
I'd finished filming the review, and found that the right hand set of buffers - which are all plastic, moulded as part of the bodyshell - had been damaged in transit. I was not very impressed with this aspect of the model. Whatever your thoughts may be of the moulded handrails, the model is clearly designed to be a cheap and cheerful representation of the new build A1. 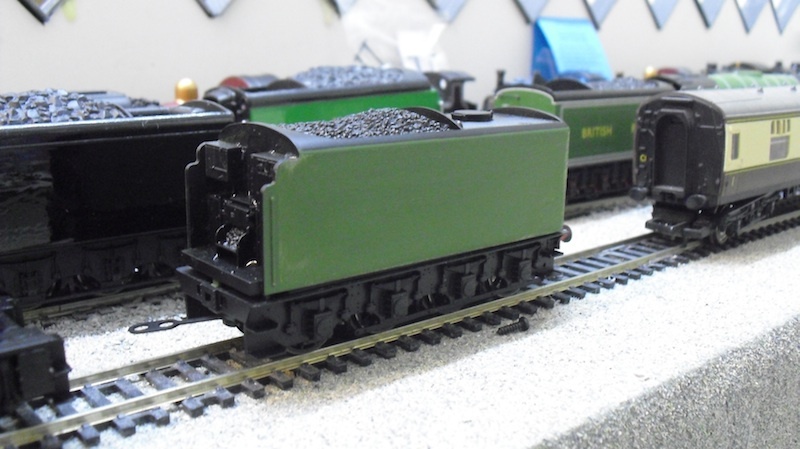 I could forgive the moulded plastic in all but the buffers, which were extremely flimsy. But it occurred to me that I could go further. In 2008, Tornado was first released for traffic. 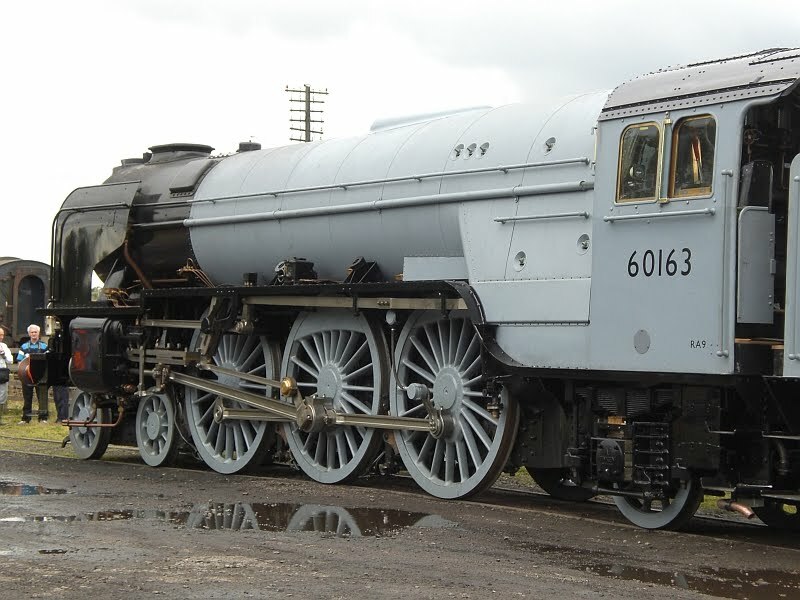 I will never forget my first meetings with 60163: firstly, outside the fence at Darlington, gazing at the unbranded, grey A1, and then the many happy days and evenings spent on the Great Central Railway, Loughborough, watching her on tests and hauling public trains. 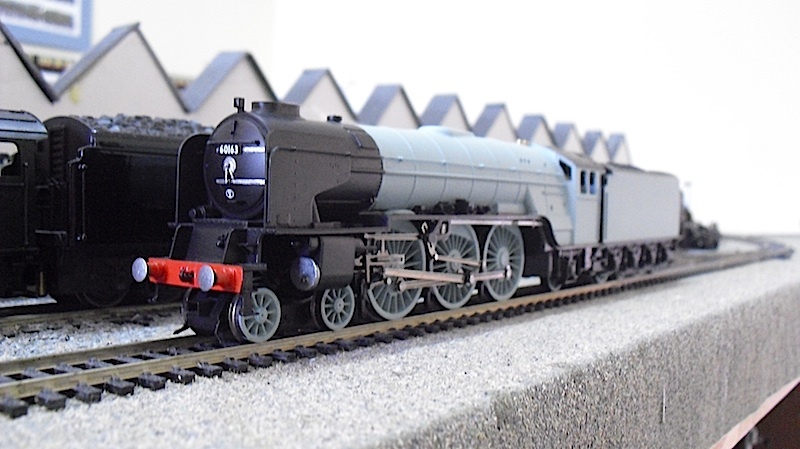 So it then followed that I figured the Railroad Tornado - to all intents and purposes, closer to the real thing than the Bachmann Tornado - would be a perfect donor for a repainting back to her early days. 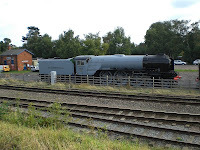 I had missed out on the TMC and Bachmann variants of the grey liveried Tornado deliberately, neither in the flesh captured the actual colour, which in the flesh, and in my photographs, betrayed a slight bluish tinge to the paintwork in certain lights. So the thoughts progressed, and the hunt began on Thursday this week, for a suitable paint colour. I'm by my own admission, a great fan of acrylics, but whilst perusing my favourite model shop for paints for a different project, a small tin of paint, with a swatch below, caught my eye. 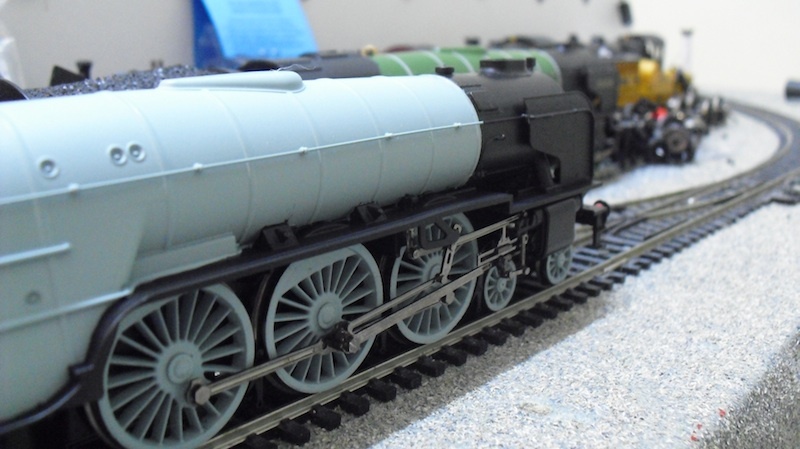 Revell number 49, "Light Blue" - it was grey, but with a bluish tinge. I looked absolutely perfect for a Tornado conversion. 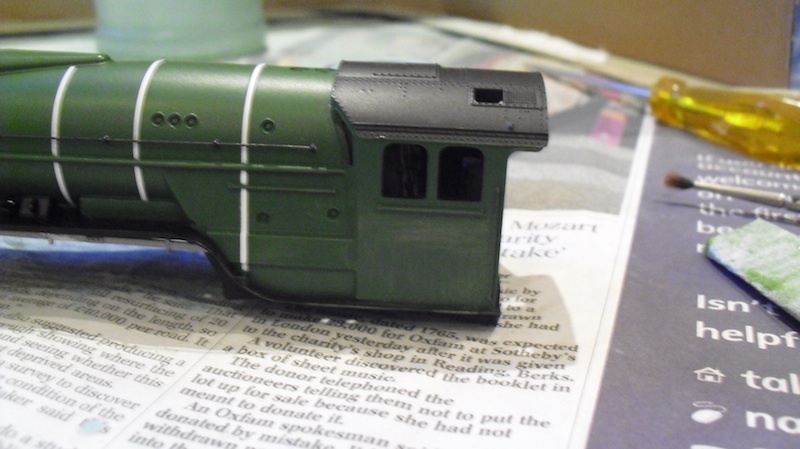 The tender body was removed from the frames, and rubbed down using some wet'n'dry paper, giving a smooth finish and removing the lining and lettering of the British Railways Apple Green livery. The wheelsets were removed at the same time, and both were taped up carefully using Tamiya masking tape. The cab was also similarly treated. Both bodyshells were cleaned and dried, before masking up and moving onto the painting stage. Mixing two parts thinner, three parts paint, I carefully sprayed two even coats of Revell number 49 onto the bodyshell and tender. The wheelsets followed shortly after, with two short, even coats applied over a ten hour period. The whole chassis had to be dismantled in order to remove the driving wheels - a word of warning, removing the valve gear and connecting rods before removing the driving wheelsets is advised. This prevents damage and makes the job of lifting them out much easier. 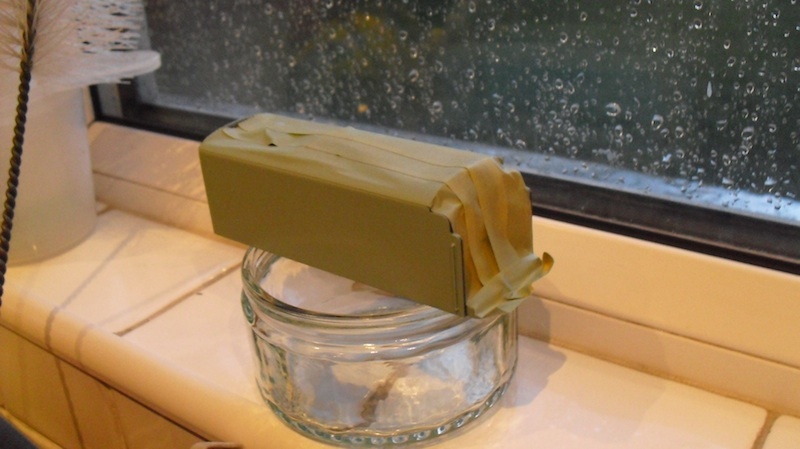 After allowing the components to dry, the tape was removed, and the components cleaned up. Gamesworkshops Chaos Black was used to paint wherever the no.49 paint had spilled over onto the areas of black, being brush applied, with two parts water to three parts paint. 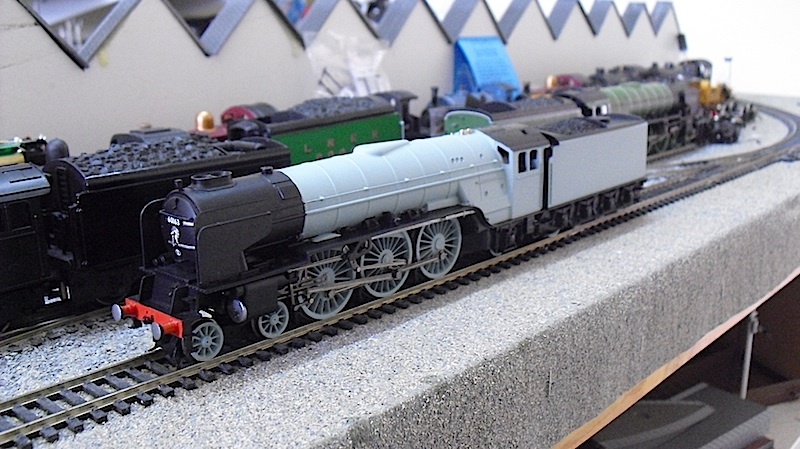 Revell number 91, "Silver" was used on the cylinders, buffer heads, smokebox straps and door dart to represent the burnished nature of the real thing. These components were all painted through brush stroking, one part thinner to two parts paint. The components were reassembled, the model tested to ensure perfect running had been retained (it had), and then I had time to pour a pint of bitter, and survey the results. The result was, in my eyes, perfect. The colour was spot on. It appeared darker, and more grey in certain lights, and bluish in others. David Elliot of the A1 Trust, had once said the original livery was an "eggshell blue" - and this choice of enamel paint matched perfectly to my memories. 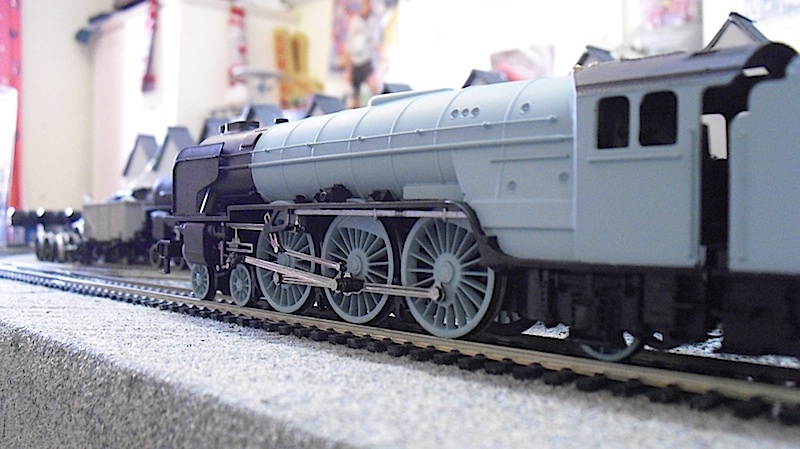 I'm very pleased with this repaint, and can honestly say that I think Hornby have missed a trick with the Railroad version. 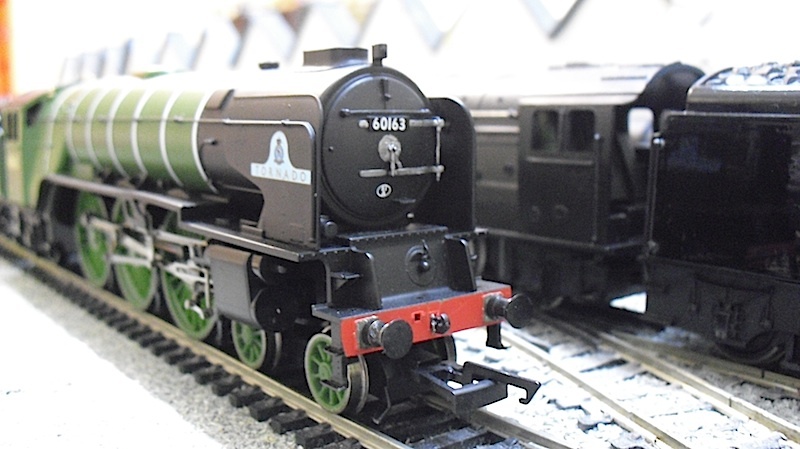 Yes, the apple green is Tornado's main livery, but the Railroad model - deliberately plainer than its more expensive variants - looked distinctly odd with such a simplified version of the apple green livery. The grey brings out the shapes and contours of the engine so much better - and it looks brighter, too. I can't quite explain it, but the model suddenly seems to have more presence now, than it did in its original form. Of course, the stovepipe chimney will need changing to a rimmed one, to be truly accurate, but to say I'm happy with the results is an understatement. For months I'd felt a little down on my modelling, the quality was poor in my view, I wasn't improving as I wanted to be, and my confidence to complete my other outstanding projects was at an all time low. For now, I'm going to put the tools down, get out a few of those ubiquitous Hornby Mk1s, and have a play with it while the F1 qualifying plays in the background. 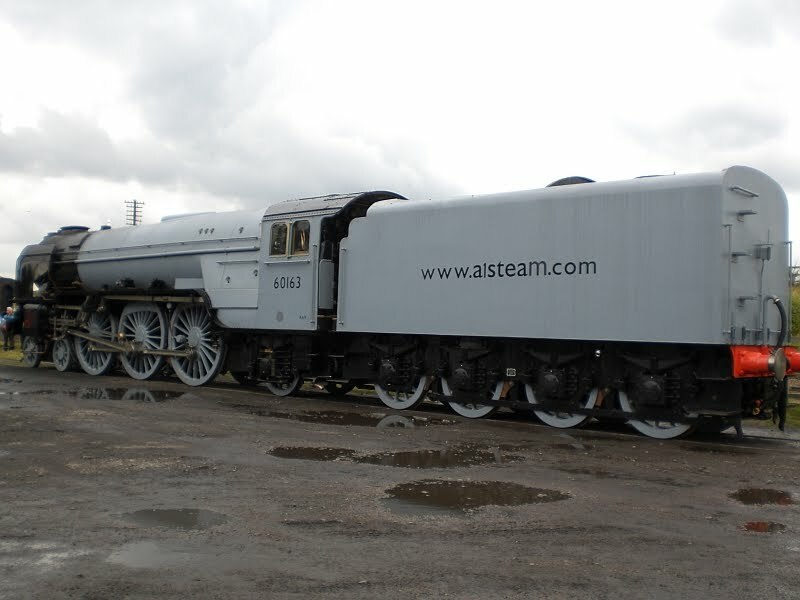 I haven't decided yet if it will stay unlettered and unnumbered, as it was in Darlington in 2008, or whether it will take on its Great Central guise with www.a1trust.com on the tender, and 60163 on the cabsides. Either way, I feel it's a great improvement on a model that was lacking somewhat in the aesthetics, but certainly not the physical components. 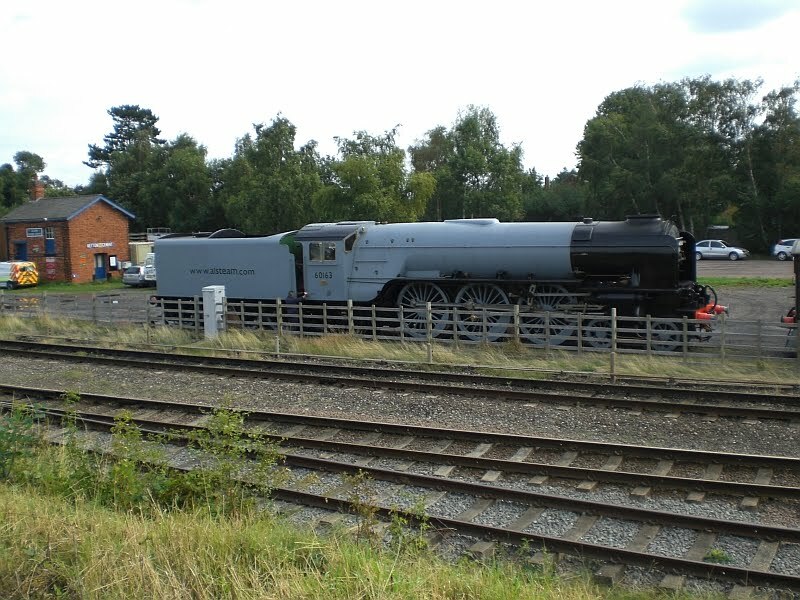 I noticed in the last picture of the prototype, the can end of the tender was green! "The British Railway Series - June Update 2"
"The British Railway Series - June Update"
"Hornby Railroad Tornado - Review"